Multipurpose Seafood Processing Line - MSP. With the detailed design drawings prepared under the earlier assignment have 4 complete MSP lines for 32 operators each been manufactured at HAYEN IND. in Hanoi in the beginning of 2003. 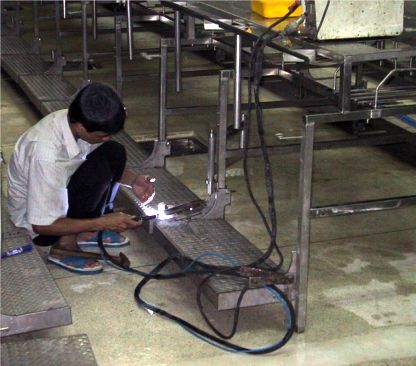 The 4 MSP lines with raw material supply system and final product conveyor was installed at CASEAFOOD in Cam Ranh in April � May 2003. The technical start-up of the MSP lines and the implementation of the testing programme were started in the end of May 2003 and the first half of June 2003. 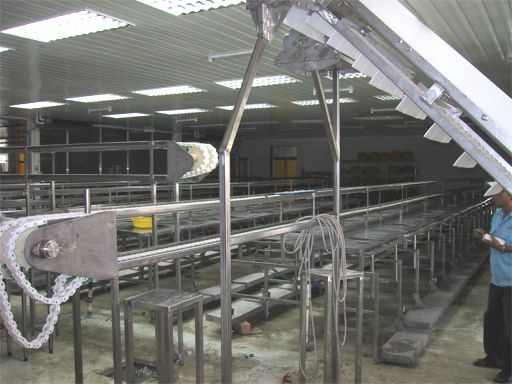 Due to technical problems with the raw material supply system and delayed manufacturing was the final installation and start-up of the total MSP department postponed until August 2003, where the revised and missing equipment for the raw material supply system was delivered. The testing programme and collection of data which was started in June 2003 was continued until October 2003. 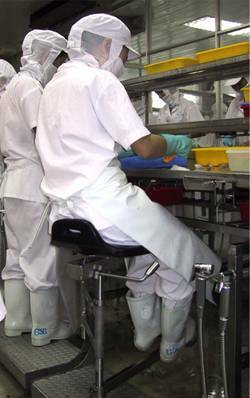 Due to the successful results obtained from the production at the MSP lines compared with the existing work tables have it been difficult for CASEAFOOD to continue the production on the existing work tables. Improved quality, due to fast throughput, first in � first out principle, less crossing of products, smaller portions in different coloured baskets, use of potable water directly from spray guns and reduced waterconsumption. Increased productivity and efficiency � from 10% to 164% higher productivity with an expected level in increase of 100%. Reduced water consumption � reductions from 4% - 95%, but with a normal level of savings in the magnitude of 70 � 80%. Reduced ice consumption - reduction varies from 13% � 67%, but with a tendency towards reductions in the magnitude of 40 - 50%. Reduced environmental impact, due to saving of water, reduced amount of wastewater, energy saving from ice production and improved collection of offal. Reduced time/temperature load on products. The results from the analyses of the workers health and the working conditions only showed improvements for the workers on the new MSP lines compared with the existing work tables � and with improved productivity obtained at the same time. The additional investment for implementing the new MSP Department at CASEAFOOD is paid back within 5 months with the results obtained. If additional improvement is obtained can the investment be paid back within 3 months. The new MSP lines have absolutely been a success and very large benefits can be obtained for the entire seafood processing sector by investing in and installation of the new lines together with a total reorganising of the layout of the existing facilities, in order to obtain much better product flows and more industrialised, efficient and easy to clean processing plants of western standard. 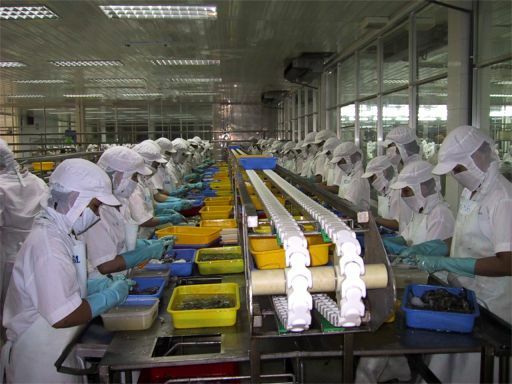 Furthermore, will the improved working conditions and the improved contribution margin be beneficial for the many Vietnamese workers in the seafood industry giving possibility for better wages and better overall working environment. For more information about the earlier work with the design of the MSP lines - click here. See a model of the future second generation of the MSP lines - click here. All 4 MSP lines in operation - June 2003. 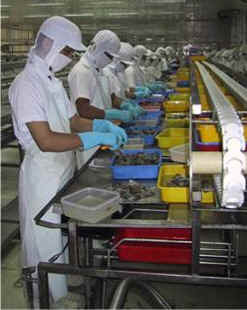 Installation of lines in May 2003 at CASEAFOOD. Local workers looking forward to start working on the new lines, May 2003. From the first day of production on one MSP line, 27 May 2003. Manufacturing of new dividing lock for the MSP lines on site.